In considering the use of haptics I was very interested in a product that would place vibrating motors on the wearer’s clavicle. To my mind, the clavicle is a sensitive space that is receptive to tactile feedback, but positioned in a place on the body where a wearable device could be concealed – or put on proud display. 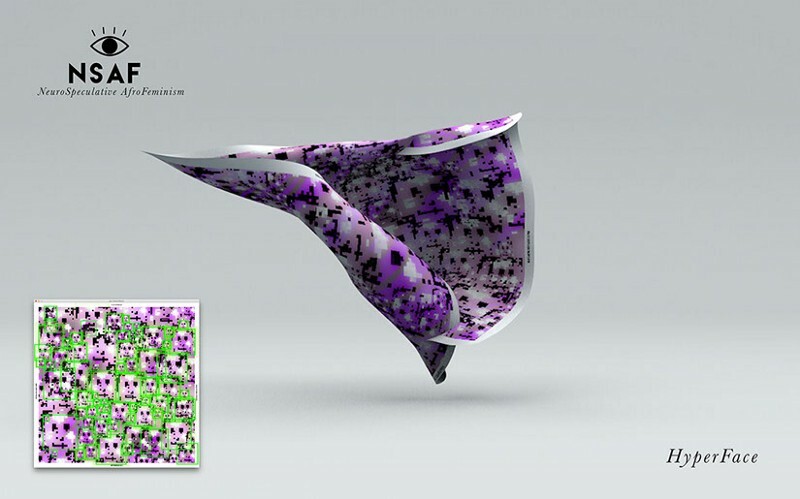 My first concept involved using a wearable set on the clavicle as a control-centre for a smartphone or other device. 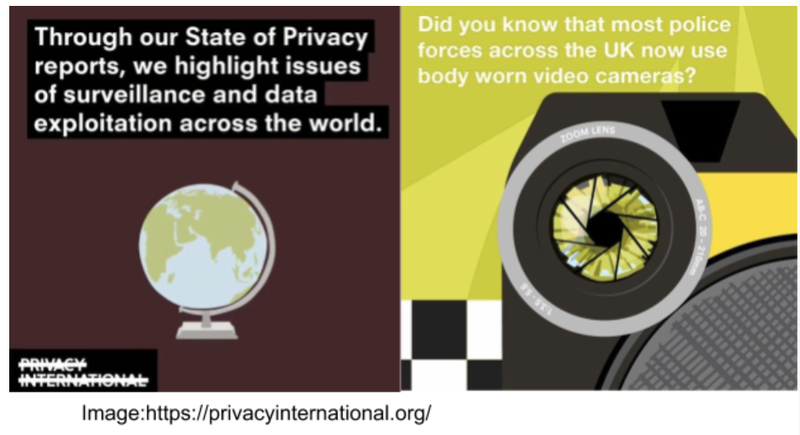 I enjoyed the notion of a wearer subtly manipulating a device by touching their collarbone, especially when contrasted with the socially-invasive procedures of controlling (for example) a Google Glass or a smart watch. When, upon consideration, this concept was out of scope and too far removed from the exploration of haptics this assignment asks for, I rolled it back into what I considered to be a simpler concept: a proximity sensor that would inform the wearer, through subtle haptic feedback on the clavicle, communicate the direction and proximity of people moving about behind the wearer. 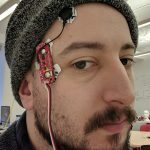 Exploring sensor options brought me to the Sparkfun Gesturesense which I borrowed from a colleague. I preferred this sensor the UV proximity sensor in our kits. 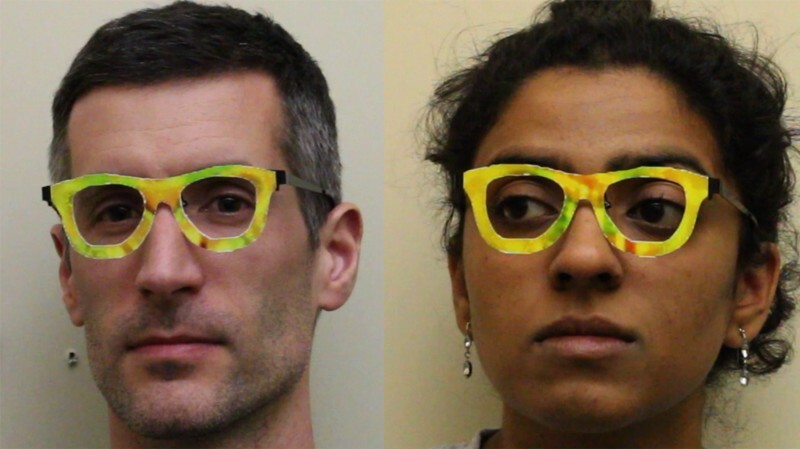 The Gesturesense could sense distance, orientation, and direction of movement, while the UV sensor could only sense distance. The UV sensor had a much better range than the Gesturesense, but I wanted to explore the new tech. 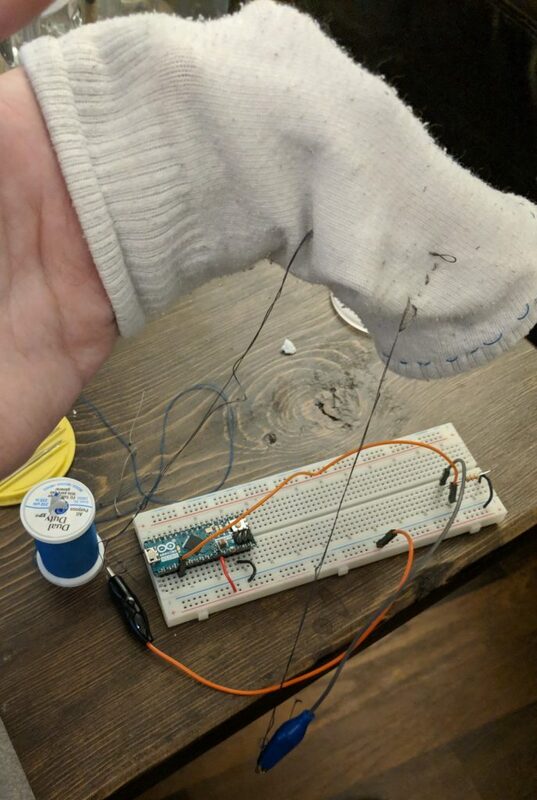 I had some trouble getting the Gesturesense working with my Arduino Micro. It’s possible it was an issue with the pins serving different functions on the Micro than on the Uno (which is supported by the documentation), because when I switched to an Uno it worked without any trouble. 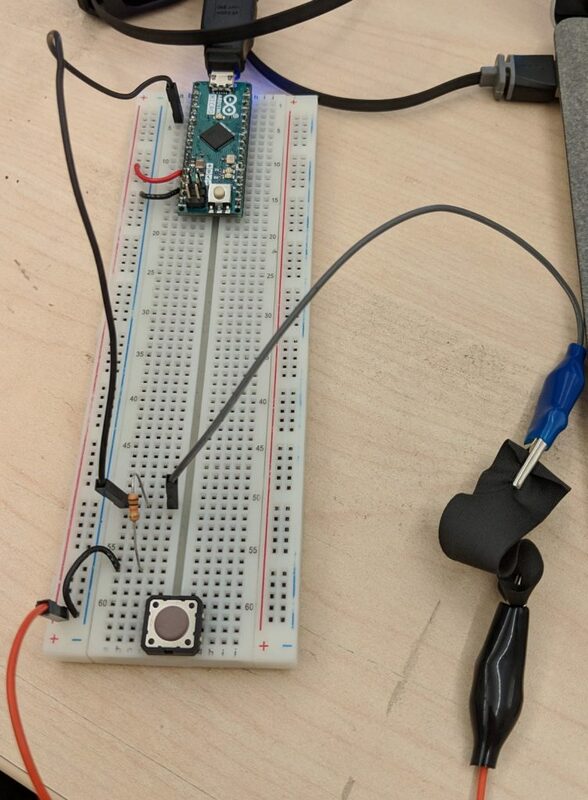 I mapped the sensor readings, which ranged from 240 (as a low reading) to 0 (max) to the simpler range of 0 (low) to 255 (high) in order that they could better interface with the vibration motors and pulse width modulation from the Arduino’s pins. I assigned the Z-position reading, the distance from the sensor, to a variable called vibeStrength, which serves as the value for the pulse width modulation on each motor. The X-position reading activates one of three motors based on the reading returned – below 80 left motor, between 81 and 160 middle motor, 161 and above right motor – based on the relative position of whoever is activating the sensor. Thus, the motors vibrate softly when the sensor subject is far away and strongly when they are close, and the motors that vibrate are based on the direction of whoever is behind. 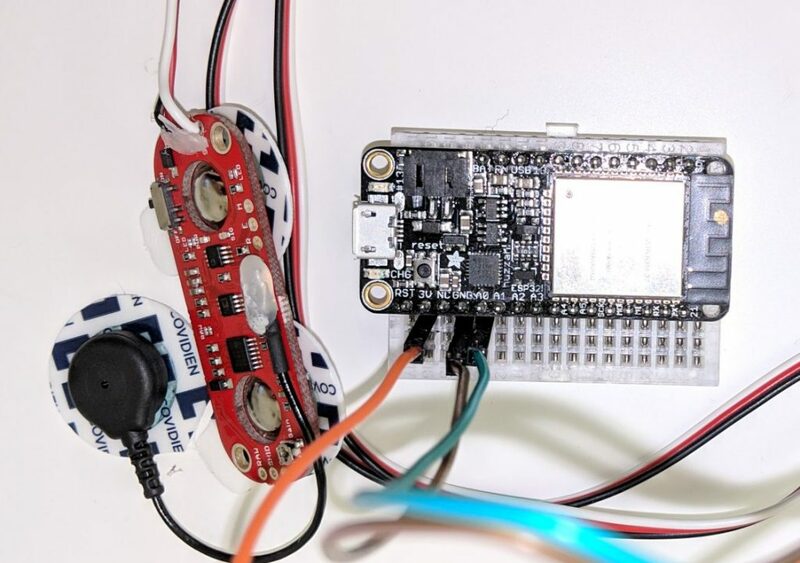 A recurring issue with the sensor is that it did not return a zero or null reading when not sensing any data – instead, it would continue to return the last number it sensed until it returned something new. This meant the outputs would remain at the last reading, vibrating at that rate, until the sensor picked up something different. This often led to the motors vibrating when there was nothing to sense, giving a false positive. To solve this, I wrote a function that would run a counter every frame the sensor was not returning a value. When the counter reached a threshold, it would turn off all outputs. 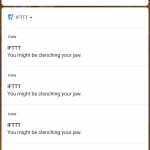 This caused the outputs to freeze at their last value if the object they were sensing moved into another area, giving false positives until none of the sensors read anything. 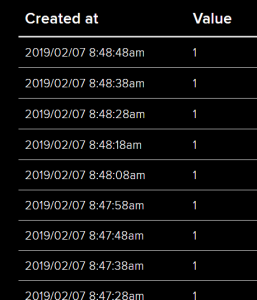 To solve this, I added an else statement to each of the statements that called the motor pins, setting their PWM strength to 0 if the sensor number returned put the subject in a different section. For now, there is no overlap between the vibration motors. 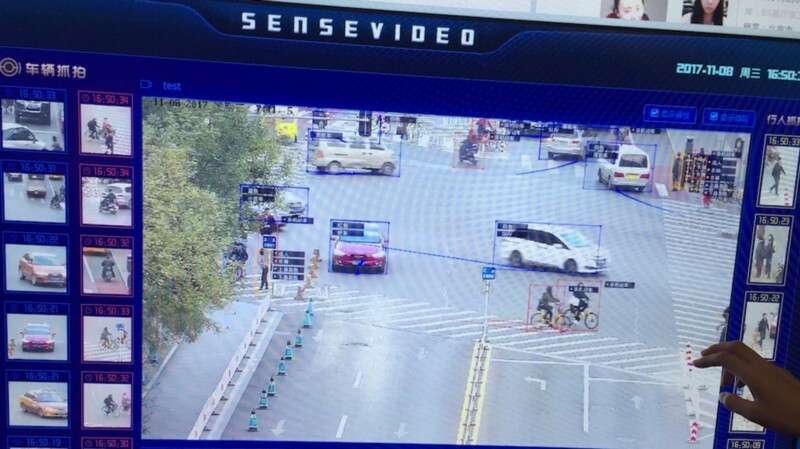 I would like if, in future, there was a smooth transition between motors as whoever is being tracked moves, rather than having each motor operate independently as is the case now. I would also like to 3d-print a casing for the sensor and microcontroller, and thread wiring through a sash, to complete the wearable. 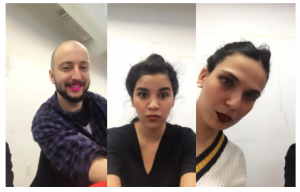 Attendance describes a speculative ambient body-centric design project in which a the relative location of a roster of people are loosely tracked. 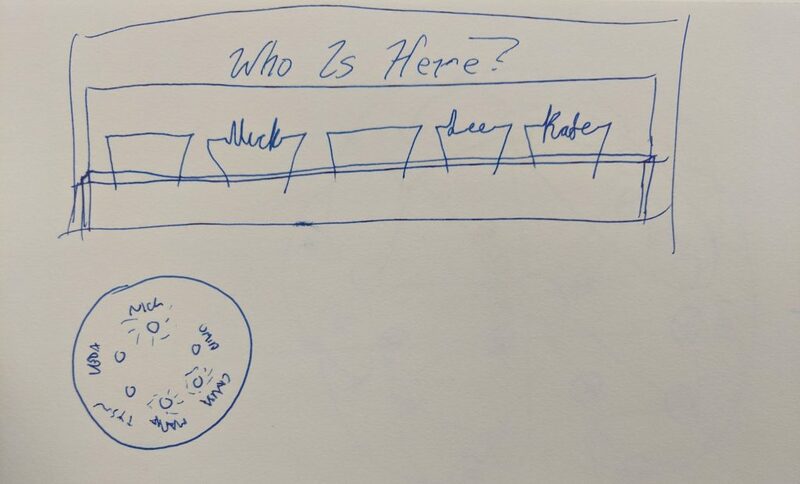 A family (or a cohort of grad students, perhaps) each have an entry on a fixture (which could be expressed multiple ways – for the purposes of this project I imagined working with shape-memory alloys) that highlights when those people are nearby. 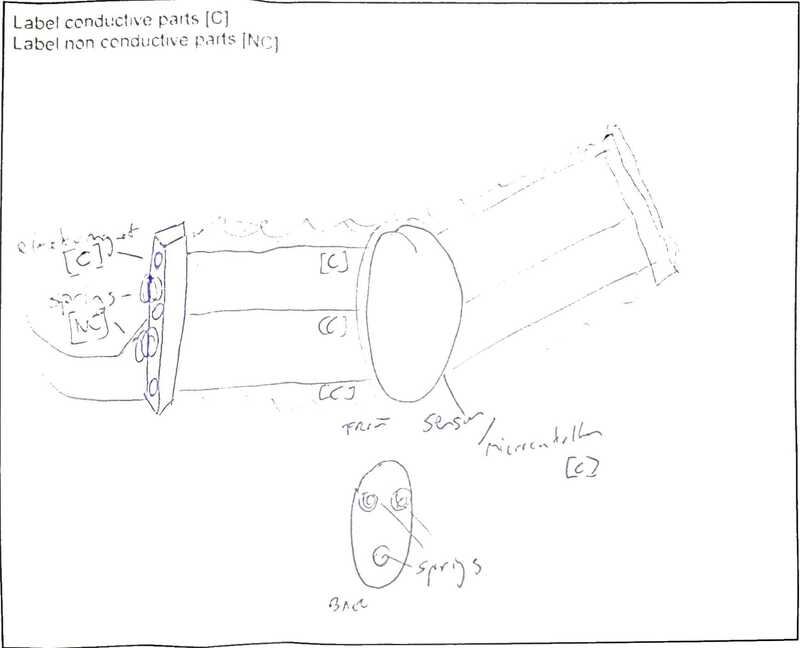 Above is a rough sketch of the fixture realized with shape-memory alloys: lengths of wire twist into an approximation of the person’s name when they are close, and unwind into nothingness when they are away. Below is the same concept rendered with LEDs on a flat clock-face. This project was researched and coded with the theoretical understanding that it would be realized with lengths of shape-memory alloy wiring. 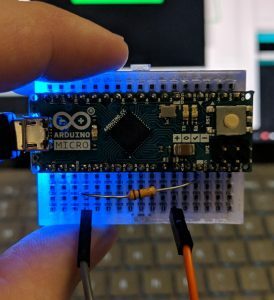 I’ve worked with If This Then That and Adafruit IO quite often recently and I’ve been enjoying it, so they were the first place my mind went to when considering how to realize this project. 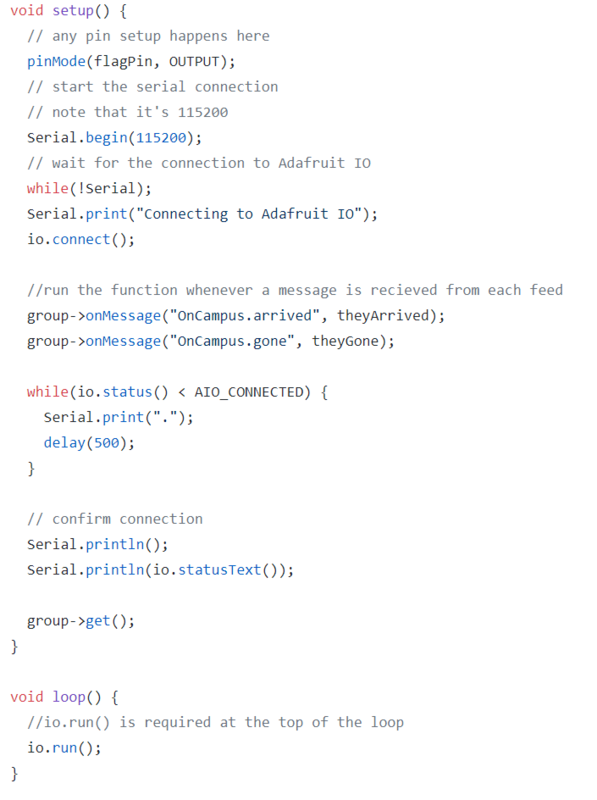 to track my location and interface with Adafruit IO. 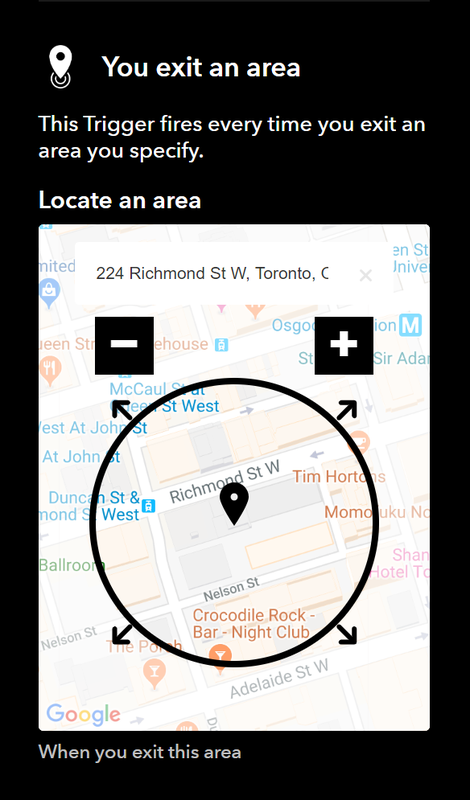 When I enter a radius around campus it sends “1” to the “arrived” feed, and when I leave the radius it sends “1” to the “gone” feed. 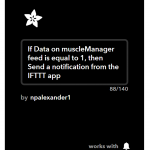 A little walking demonstrated that IFTTT and Adafruit IO were interfacing correctly: below you can see that the feeds successfully tracked the instances when I left for lunch and when I returned. Without shape-memory alloys to play with I had to get speculative with the code. I did some research and learned that SMAs require careful voltage, with some trial and error depending on size. I set up my code to use a transistor and pulse width modulation so that when it is eventually hooked up to SMA I can find the ideal voltage for it. 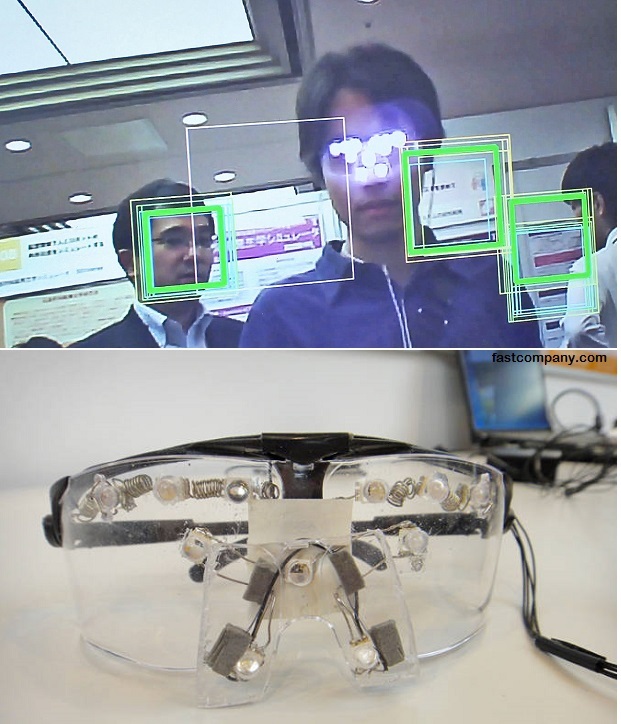 In the photo below the LED is in the place of the shape-memory alloy. 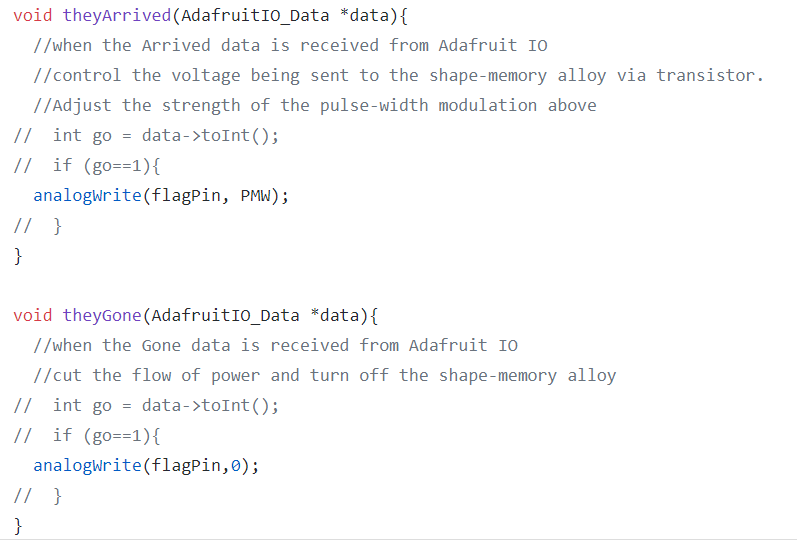 It took me a fair bit of digging to figure out how to monitor multiple Adafruit feeds in one sketch, and I continue to have some trouble with the syntax of the functions in the Gone/Arrived sections of the code. I’d like the chance to work with shape-memory alloys properly and expand this concept – until then, I can prove the concept with an LED. The Range of Motion Visualizer is an exploration of the capabilities of stretch-sensor conductive fabric. The Visualizer uses a stretch-sensor in a bending motion rather than a stretching one and visualizes the output as a multicoloured band. 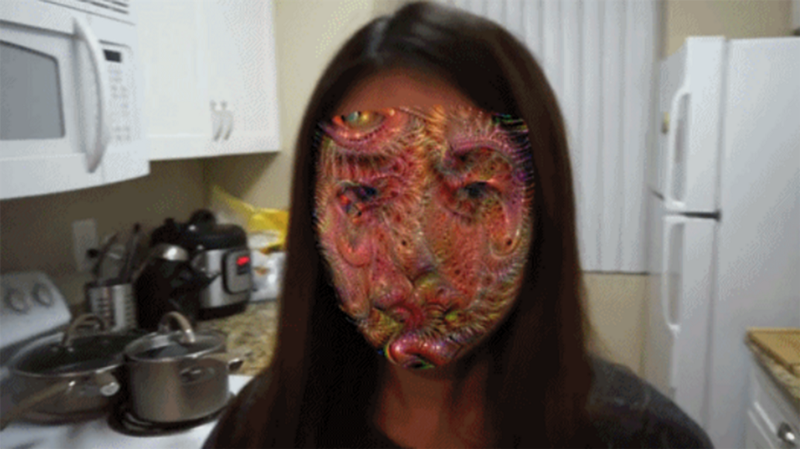 In concept, the Visualizer is imagined as being used as a rehab tool. When prescribed a limited range of motion as a part of physical therapy, a wearer would calibrate the Visualizer to their prescribed range. They would see their motion represented. Safe motion that would not harm their recovery would (at this stage, anyway) be represented by a small green bar. The bar would elongate and turn yellow as they approached the outside of their prescribed range, and turn red when they were outside it. 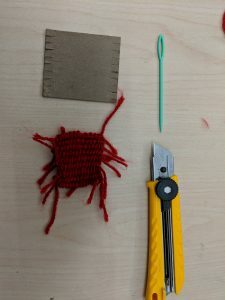 After exploring the functionalities and properties of the fabrics we had been given in-class, I decided to work with the stretch sensor. 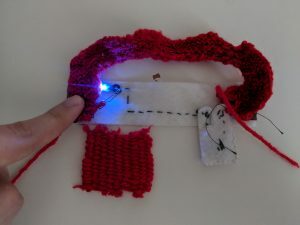 I had worked with pressure sensors briefly in the first semester, so I preferred not to work with them, and had been knocking around the idea for a wearable that would visualize motion for a little while, inspired by the Motex Project for smart textiles. The stretch sensor was an opportunity to realize that idea. 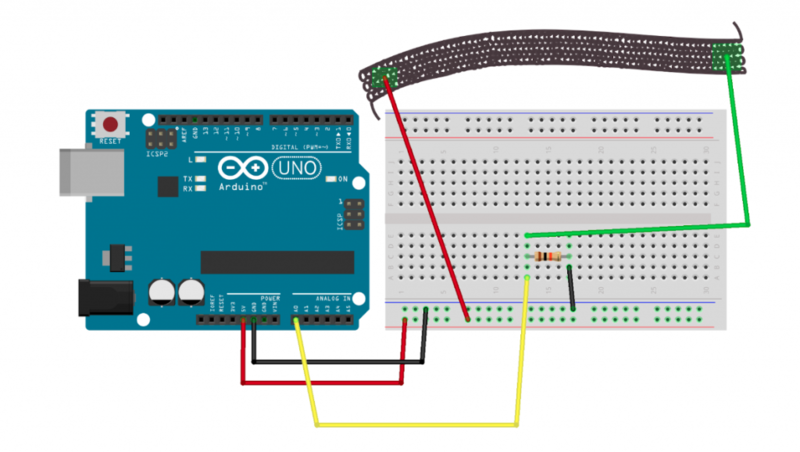 I put together a circuit using the diagram provided in-class as an example, and ran it while looking at the Arduino Serial Port to see what kind of readings it generated. Then I took some code from the Ubiquitous Computing class and used it as the basis for moving the sensor readings into Processing. When that confirmed that Processing worked, I wrote some code to adjust the length of a displayed rectangle based on the sensor reading. After a few tests I determined what felt like a good range to implement the changing colours – yellow for approaching the danger zone, and red for beyond. Then I put together the sleeve for holding the sensor. I took an old sock and cut away the foot. 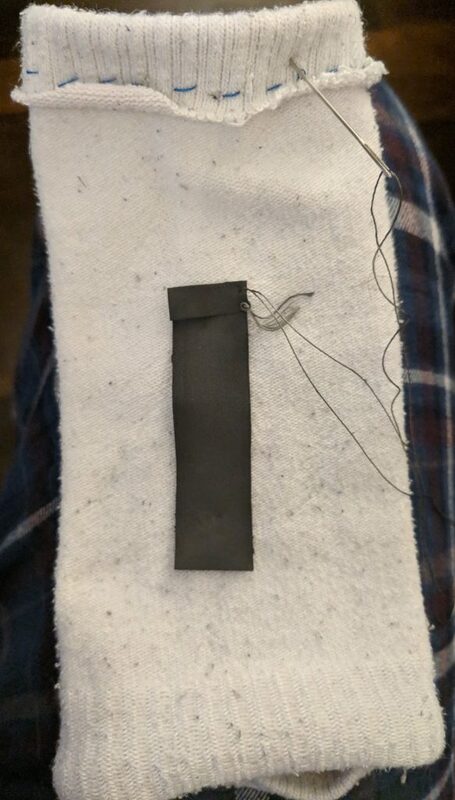 I sewed a hem into the sock, then turned it inside out and sewed in the length of stretch sensor fabric with conductive thread. I left long lengths of conductive thread to attach alligator cables to while testing. In testing this was uncomfortable and unwieldy. Because of the simplicity of the circuit I decided to minimize it. I used a small breadboard. I removed the extraneous wires and ran the power side of the sensor directly from the 5V pin. I set up the variable resistor directly from the A0 pin, and the resistor directly to ground. I removed the extra threads and sewed patches for alligator clips to attach to. I had to recalibrate the code at this time, as the sensor had begun returning lower readings. As a nice bonus, touching the two pads completed the circuit and served as a default “max” for the range-of-motion tracking function. I continued to explore visualization. I wanted to create a curve that mirrored the bend of the user’s arm. I used the curve() function, as well as explored using curveVertex() within the beginShape()/endShape() functions. I did get a reactive curve going, but I decided that it was not as strong a visualization as the bar. This could easily be made wireless – perhaps with XBees? I would have to do more sewing, including a pocket for the microcontroller. 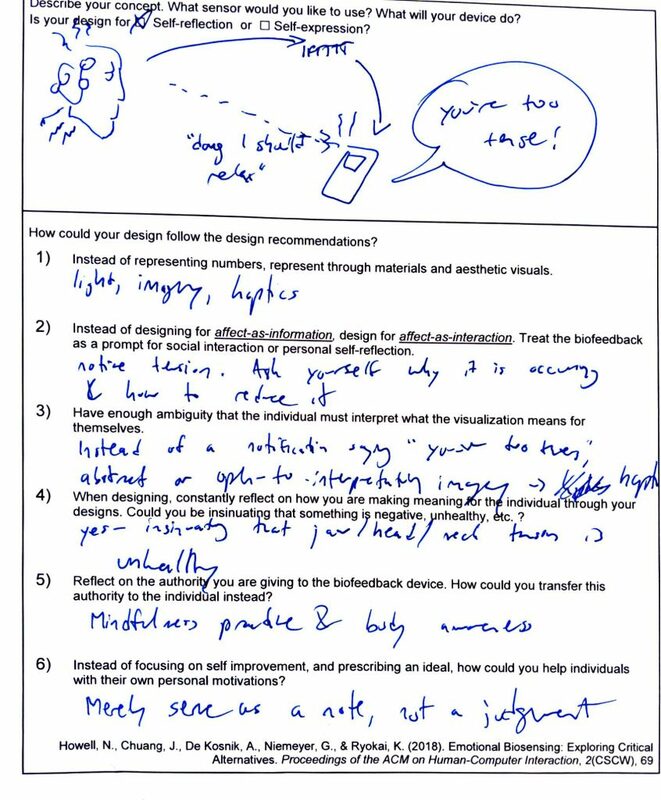 I also considered exploring haptic feedback in addition to – or perhaps instead of – visual feedback. I would like to include a vibrating motor that would buzz lightly when in the yellow zone and strongly when in the red. 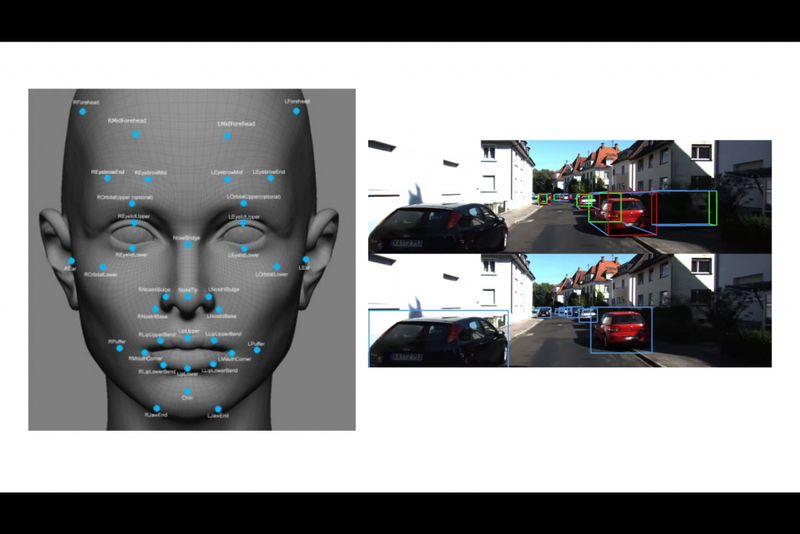 Beyond that, I would want to create a means for quickly and simply re-calibrating the sensor on the fly, and continue working on using a curved image as a visualization. 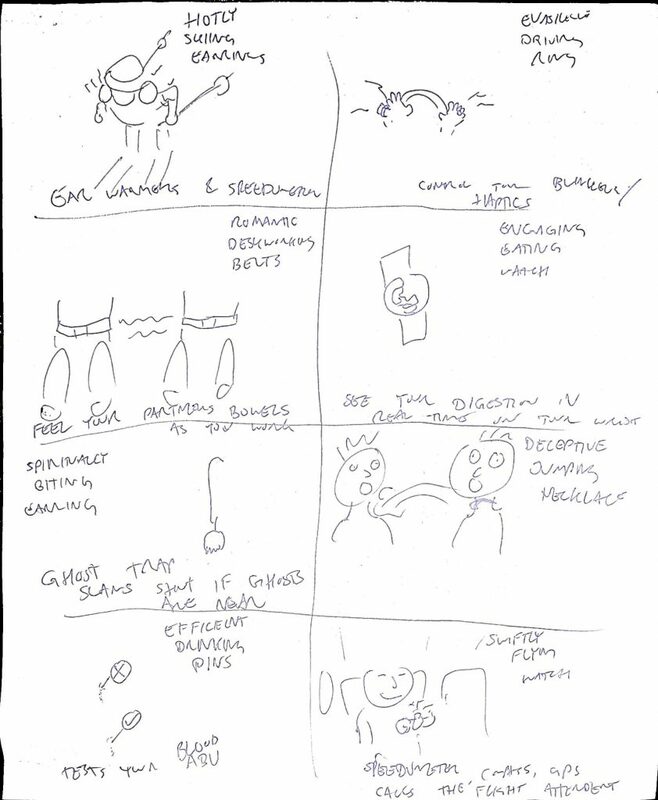 After a creative elicitation exercise involving mix-and-matching verbs, adverbs, and feelings, I sketched out a series of goofy designs. Many of them were so goofy or so obtuse that when it came time to select one to pursue for this project, they had to be discarded by default. 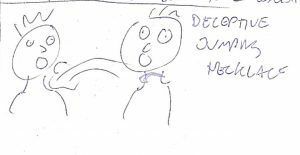 The one idea that I thought would be achievable based on the parameters of the assignment, and not so complex as to necessarily require a microcontroller, was the so-called Deceptive Jumping Necklace. The Necklace would sit clasped on its wearer’s neck until, when it was most unexpected, it would unclasp and leap off. When expanding the design I imagined it held fast by a set of electromagnets controlled by a microcontroller hidden in the central pendant. This central pendant would also hold springs that would push the necklace away when it was activated. 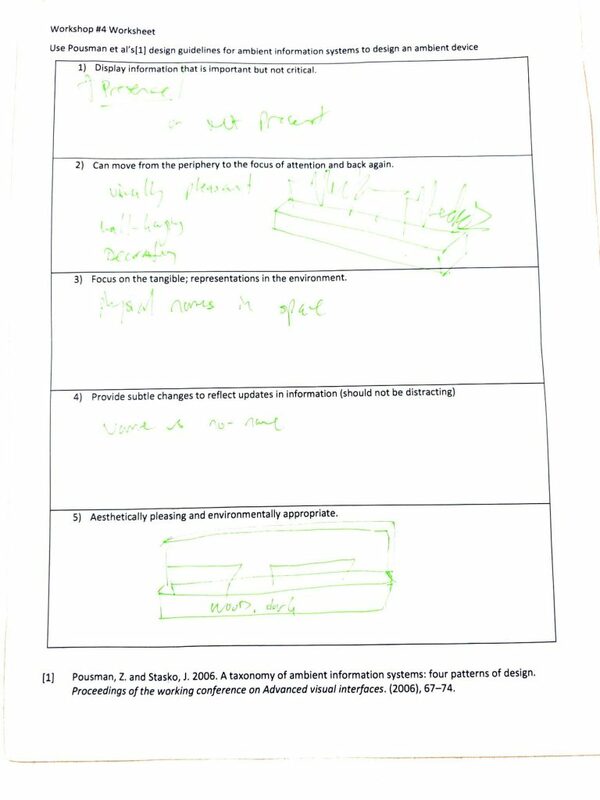 It was goofy, but it could be read as a piece of critical or dark design, which are design avenues I am interested in. I had no practical experience with knitting. 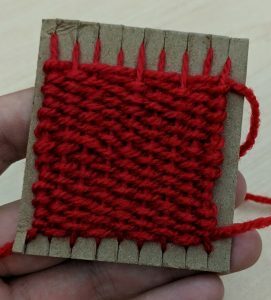 I had done some simple weaving before, but I wanted to learn to knit. Even at the time I felt that weaving would be more appropriate than knitting for this object, but I wanted to take the opportunity to push myself and learn something new. I planned to knit the body of the necklace and weave a small patch to serve as the mounting for the magnetic clasp. It took me several false starts to get the hang of knitting. 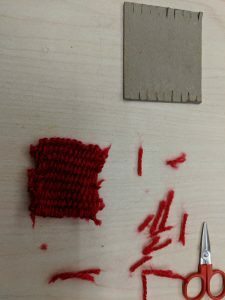 The first round of stitches that set up the first needle was simple enough, but the process and movements for the core stitching did not come easily. Furthermore, in my hubris, I had asked my instructor for small needles as I wished to knit something that would have the same stitch density as a weave. She warned me that large stitches would lead to larger loops which would be easier to knit, and she was right. The small loops were difficult to keep ordered and occasionally got very tight. I had to stop and restart several times, but eventually, thanks to a very helpful YouTube video, I got it going. While knitting, I decided that a necklace was the wrong form for the project. 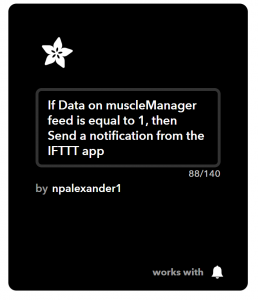 A bracelet would maintain the same kind of affordance as the necklace with respect to the critical design aspects, and would be a little simpler and faster to make. 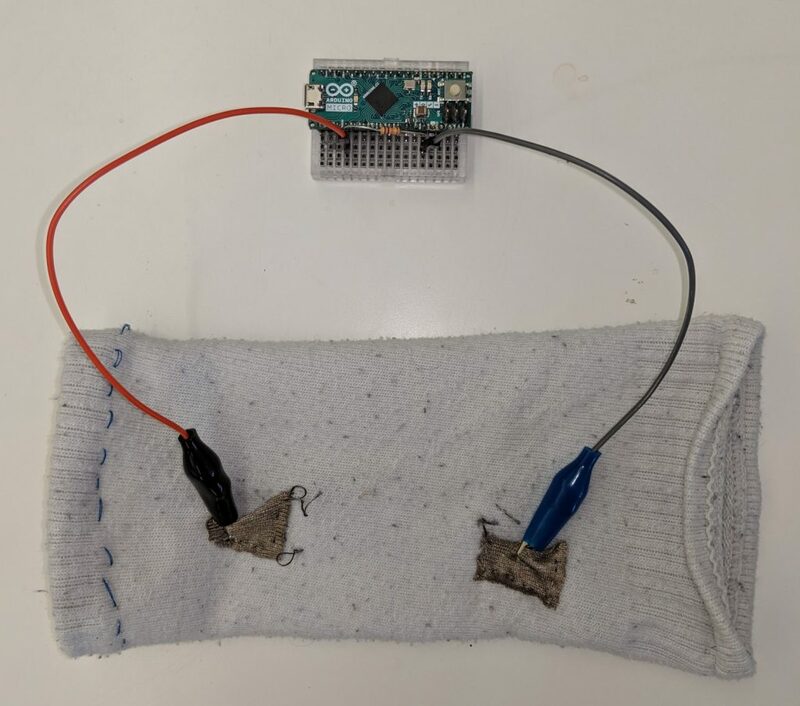 Also, I had by now decided to try to realize the project without a microcontroller, and a bracelet would be a better fit for an object that was just a swatch of knitted cloth. 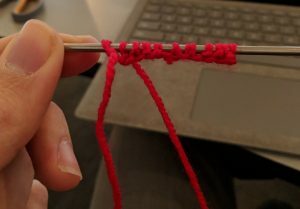 As I knit, I attempted to include two lengths of conductive thread – one of the fourth stitch from the beginning, and one on the fourth stitch from the end. These will eventually become the wiring that keeps the clasp engaged. The bracelet turned out well enough considering it was my first serious foray into knitting. 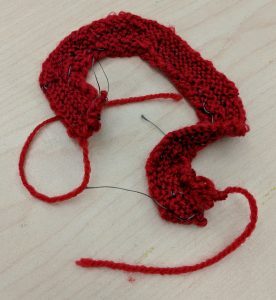 For some reason – probably through missing or fouling up stitches – the finished knit has a distinct curvature to it, which works for a bracelet! For the next step, I wove a swatch to serve as a place to anchor the clasp mechanism. I had done some weaving in workshops previously so this was familiar to me, and a YouTube video was a good refresher. I tied off the cut portions of the weft and trimmed them down. There is much more work to do. Having never knitted before, I spent a majority of the week getting comfortable with the process through trial and error. I understand now how to recognize a mistake and fix it right away, which I did not when I began. Mistakes I made early in the knit were deeply woven before I recognized what they were. 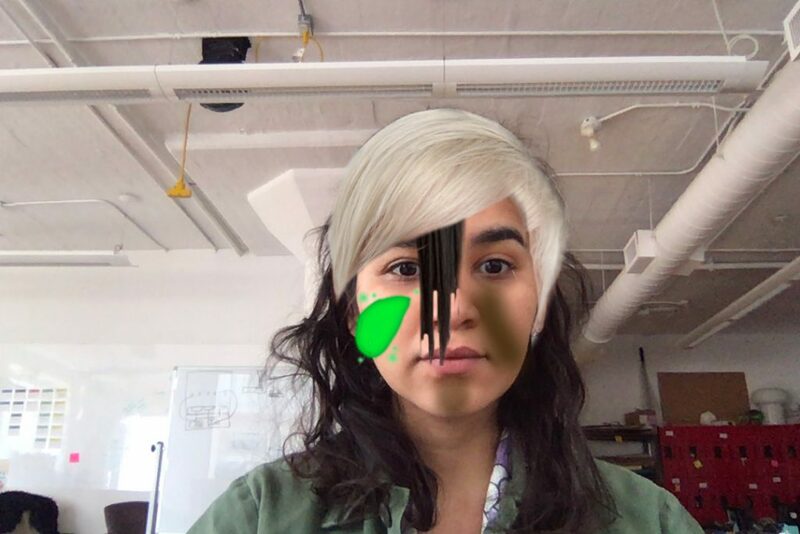 Furthermore, I settled on the initial design of the project before I truly understood the needs of it. 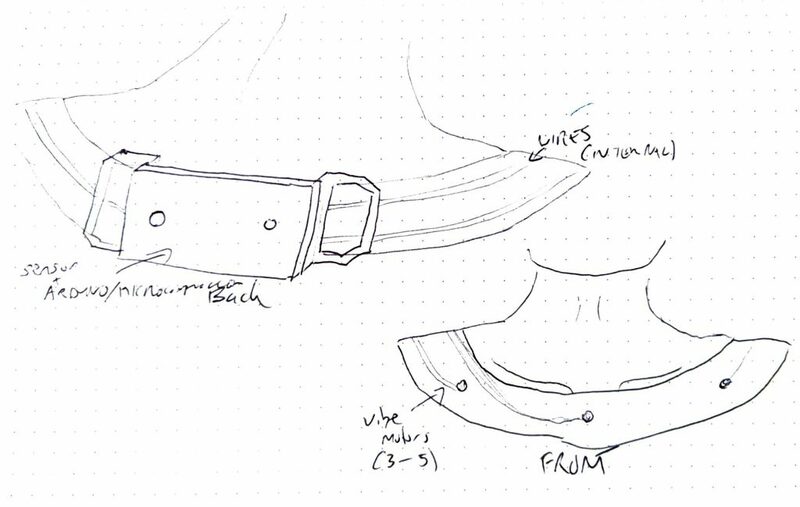 Before this piece is completed I intend to re-imagine it so it can function without a microcontroller, and to utilize one of the fabric-based sensors. Perhaps I will eschew magnets altogether? While I’m disappointed to not have a completed product I am excited to have discovered knitting, which I find fun and relaxing. Now that the hurdle of learning to knit has been overcome I’m looking forward to continuing exploring, and perhaps knitting myself a big fluffy scarf.